Provincetown, MA — It’s difficult to realize that some people in our community are in dire need of warm, winter clothing. 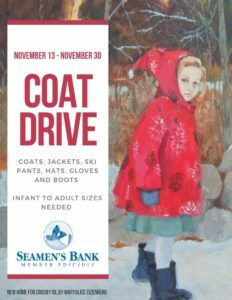 Seamen’s Bank will be collecting new and lightly used coats, jackets, ski pants, hats, gloves and boots at all locations, items will be donated to Mass Appeal. We are accepting all sizes, but infant to teen sizes are needed the most. In advance, thank you for donating by November 30th to make this a brighter winter for everyone in our community.